This is the 32nd in a series of posts on the Fujifilm GFX-50S. The series starts here. There have been conflicting reports about whether the Fujifilm GFX 50S focuses at taking aperture or not. It’s an important question, because, as we’ve seen in the last post, the 63 mm f/2.8 lens has a moderate amount of focus shift, and should be focused at the taking aperture in situations where image sharpness at the focus point is critical. It sure looks like it’s stopping down to focus when you peer into the lens while firing off frames, but it all happens so fast that you may just be looking at the lens stopping down after it achieves focus. I’m not going to bury the lede, here. With the 63 mm f/2.8 lens attached, the GFX does not achieve critical focus anywhere near constantly at f/4 and f/5.6, and even f/8 is a little dodgy. I’ll show you the chart with the smoking gun first, explain it a bit, and then go into painful detail about how it was generated for those of you who either care about such things in the abstract, or need to know what I did to replicate it or find out if it passes your personal muster. 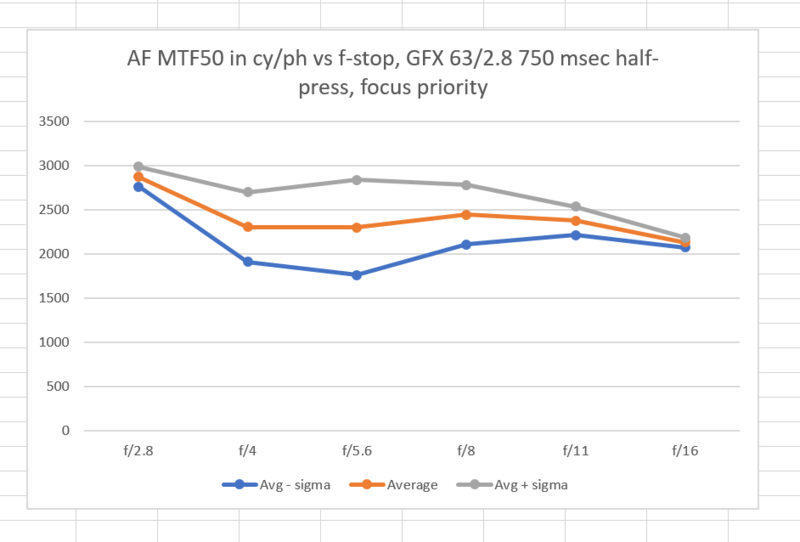 What you are looking at is a standard measure of sharpness, MTF50, as measured in cycles per picture height (cy/ph) at the whole stops from f/2.8 through f/16. The orange line is the average, or mean, of the 41 exposures at each aperture. The gray line is that average, plus the standard deviation for the 41 exposures, and the blue line is the average minus that standard deviation. If the data were Gaussian (which it isn’t) two thirds of the values would be between the gray and the blue lines. A word about the processing. The images were developed in Lightroom with default settings except for white balance, which was set to the target white with the eye dropper. Since the Lightroom default setting includes some sharpening, these numbers are higher than the raw channel numbers that I have posted earlier. For now, you should compare these numbers only to the other ones in this test. The f/2.8 distribution is nice and tight. I haven’t tried yet, but I don’t think I could do that well with manual focus. However, the f/4 and f/5.6 distributions are by comparison pretty sloppy. 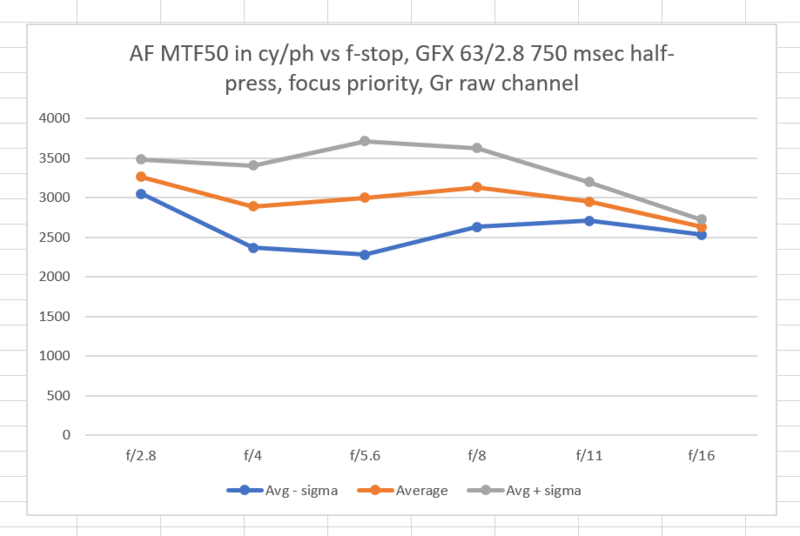 Not only that, but the averages for those two stops are lower than the average for f/2.8. That’s not the way it should be. We have seen from the previous tests that the 63/2.8 lens is sharper at f/4 and f/5.6 than it is wide open. I need to but this behavior into context. I’ve never tested an autofocus lens/camera system that is anywhere near as sharp as the GFX and the 63 mm lens. The sharper the imaging system, the more difficult is is to achieve a focus that gets the most out of it. SO I don’t know if there si a higher quality alternative available. This is making me want to test the X1D. At f/8, the spread is tightening up. That doesn’t necessarily mean that the AF is getting more accurate; it could be — and probably is — that he depth of filed is starting to make the foucs accuracy less important. That is proably also the explanation for the nice tight spreads at f/11 and f/16. The average at f/4 and f/5.6 is not only lower than that at f/2.8, it is lower than that at f/8, where diffraction is holding down the on-axis sharpness. Thus, I think it’s safe to say that the lens is not achieving critical focus at f/4 and f/5.6. That makes me ask myself if it’s actually focusing at the taking aperture for those two stops. But the more important thing is that is does not seem to be constantly focusing in the same place. Let me be clear that the average at any aperture never drops below 2000 cy/ph, and 2000 cy/ph is exceedingly sharp. I’m not saying that any of these sets of readings means that the camera’s AF system delivers fuzzy images: just not as sharp as they should be. The numbers are slightly higher even though Lightroom sharpens during demosaicing. You’ll note that f/5.6 produces some sharp and some not-so-sharp results, depending on the luck of the draw. 117 AF point mode, center point chosen, default size. The above data is not the first series of test images that I made. Initially I made images with alternating 500-millisecond half presses and no half presses at all, with the camera set to release priority. 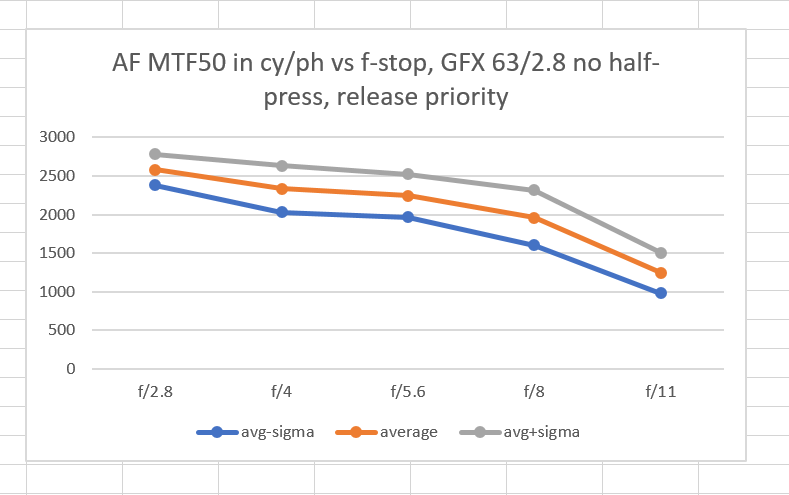 It’s clear from the above curve that 500 msec with release priority is not long enough ath f/8 and f/11. Interestingly enough, the results at f/4 and f/5.6 don’t seem to have been adversely affected. I’ve circled in red the points that I’d like to call to your attention. They are the f/4 and f/5.6 results that are high. It may be that the average is being dragged down not by a systematic focusing at the wrong f-stop, but by random focusing errors. 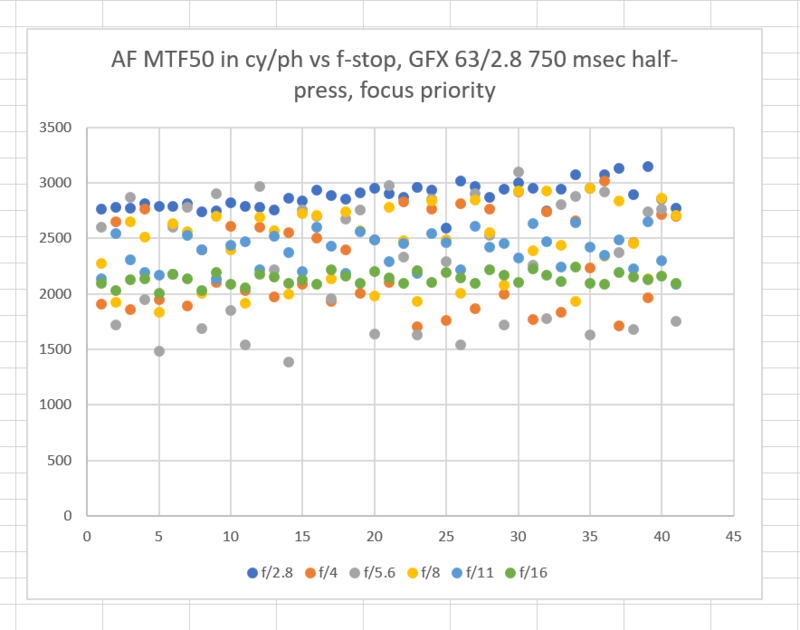 It’s hard to say, but looking at this graph makes me think that there is some systemic source of error, since there are hardly any f/4 or f/5.6 poits as high as the bulk of the f/2.8 ones. 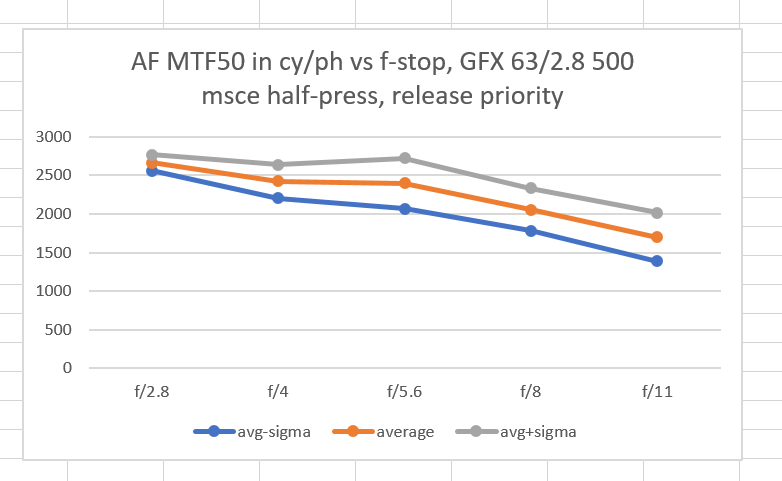 You can also see that both f/4 and f/5.6 have some quite low values. did you take the pictures in Aperture Priority mode? After reading your first article on focus shift and the Fuji focusing wide open and stopping down before exposure, as soon as I got the GFX I made a quick test. It looks like the Aperture Priority mode is the only one where the camera behaves this way; in Shutter Priority or Manual the lens appears to stay stopped down. Congratulations for your terrific work, I constantly follow your blog and it amazes me every time. I did use C mode on the lens, and A on the shutter. Just an idea… Could be that it examines focus and if the algorithm finds good sharpness it just leaves it there? Once the camera has moved long enough to cause unsharpness it would seek new focus. 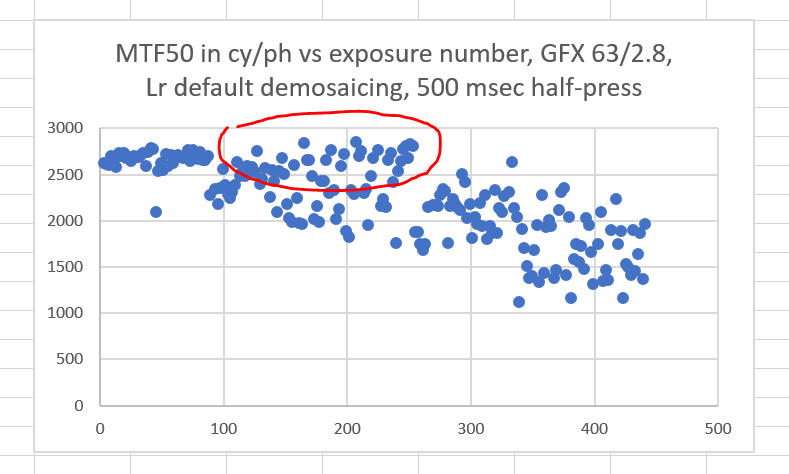 So that would mean that say each third exposure had good focus, next exposures drop a bit. That’s why I moved the camera between exposures. But that turns out to be unnecessary. The camera starts focusing from an OOF position for each exposure even if you don’t move it. Hi Jim, thanks for all your efforts, great source of quantitative reliable information. 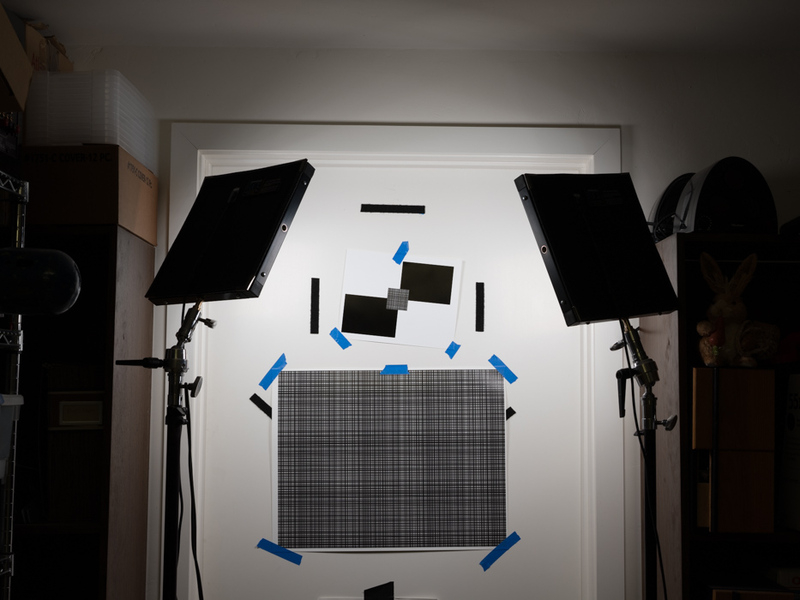 At apertures from f2.8 to f5.6, the camera closes the aperture to that value and performs the auto-focus at that f-stop as soon as the shutter is half pressed. At apertures smaller than f5.6, the aperture is first closed to that particular value, so one sees in life-view the world at that chosen aperture but as soon as the shutter is pressed half to focus, the aperture opens to f5.6 (that means auto-focus is carried out at f5.6), as soon as the shutter is fully pressed for the exposure, the aperture is closed to the first value. Is that your finding too? 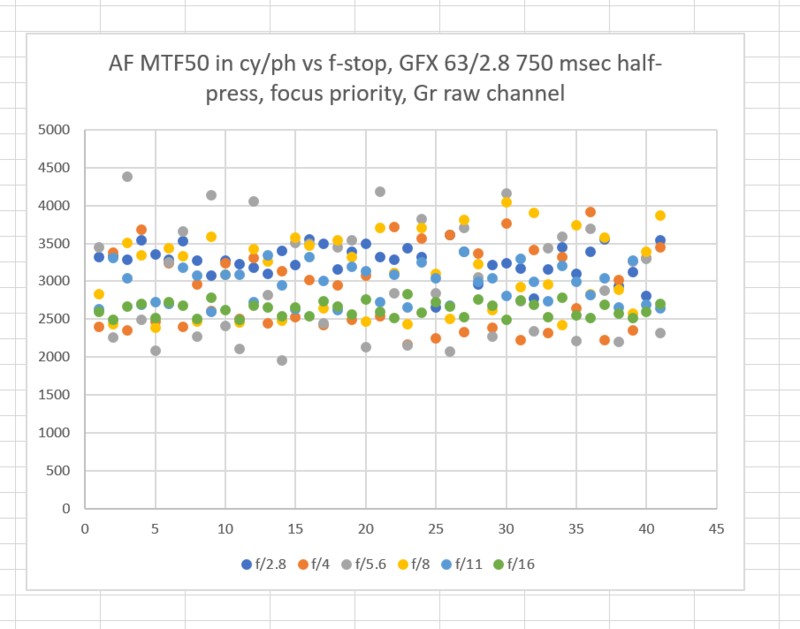 That might not be an explanation for the inconsistent af precision result at apertures around f4 to f5.6 but maybe a hint. Carrying out my test I see one thing: I have no sturdy tripod at hand and the af of the 63 moving the whole front lens group out and in moves the whole camera on the tripod a mm or so back and forth. So I am wondering if the camera has any chance to focus perfectly that way. I’m doing my testing a a set of the biggest, stiffest RRS legs there are, so I don’t think that tripod motion is a problem. If it were, wouldn’t the f/2.8 results be inconsistent as well? Jim, are shutter speeds at f/4 and f/5.6 1/160s and 1/80s resp? If so those are in the camera-shake danger zone, any chance of any of that? Jack, I’m using EFCS, so the “danger zone” doesn’t apply. Also, these are the same shutter speeds I used for the razor blade tests with the motorized rail, and there was no problem there.